Some new touch screen technology is being created that would allow devices such as the Apple iPhone to work when the user is wearing gloves or using a pen. The touchscreen technology has screens ranging from 3 to 10 inches in size (iPhone to iPad size) and still uses a capacitive touch type technology using projection. 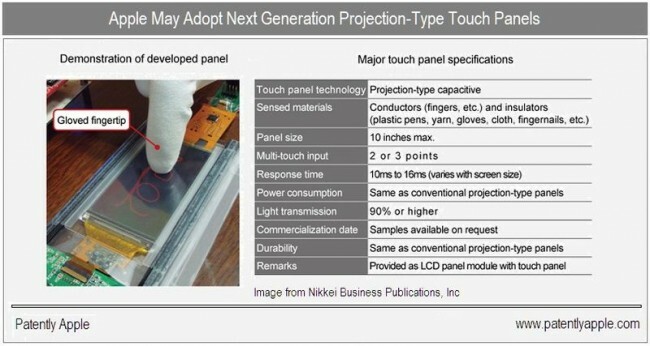 The new touch panel is still a projection design, but could be operated even while wearing gloves. Users could select icons with the tip of a fingernail, input handwriting with a plastic pen, and enjoy a wide range of other input methods. In short, it overcomes the disadvantages that the technology had suffered from in comparison to resistive films, making possible multi-touch operation with both insulators and fingers. One of the problems at the moment is the multitouch points. The details below indicate that only 3 multitouch points can be recognized which probably wouldn’t cut it in an Apple iOS device. There’s no guarantee that we’ll see this technology in a smartphone or tablet any time soon, but it certainly gives an indicated about which direction touchscreen technology is headed.